In a world where most energy production comes from non-renewable resources, people are trying to find efficient and price-effective ways to use renewable energy. One of the great leaps in renewable technology has been the solar panel, which is composed of several solar cells that convert light into electricity. We would like to give a big thanks to National Geographic for the great article. Although some people associate solar panels with new age technology, scientists have actually been working with solar cells for nearly 200 years. 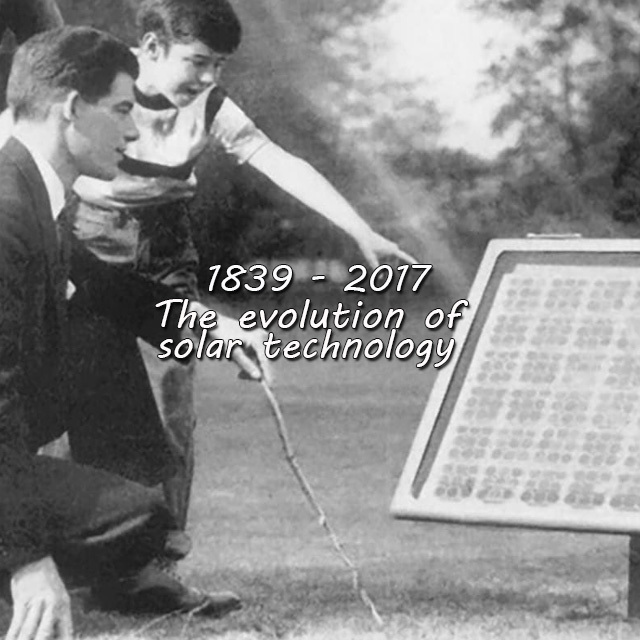 The evolution of solar panels has been a slow but worthwhile undertaking. The first huge step in solar panel technology came when Alexandre Becquerel observed the photovoltaic effect in 1839, which occurs when a material produces electric current when exposed to light. It was not until 1888 that the first solar cell was actually built by Aleksandr Stoletov. His cell was based on the discovery of the outer photoelectric effect, which caused electrons to be emitted when energy (such as sunlight) was absorbed. Solar panel technology did not become well known until Albert Einstein published a paper in 1904 on the photoelectric effect. Using technology from Einstein and earlier scientists, Bell Laboratories produced the first modern photovoltaic cell in 1954. The cell was not very effective, costing R3300 to produce 1 watt of electricity; the same wattage could be produced for R14 to R28 in a coal plant. While the technology was expensive, it was found to be cost effective for the space program. The first satellite to use solar cells to back up its main power source, the Vanguard 1, was launched in 1958. These cells, though cost-effective for space exploration, were not very efficient for terrestrial uses until one year after the Vanguard 1 launch, when Hoffman Electronics created a solar cell that was 10% efficient. This set the stage for more effective uses, including solar cells being used in 1967 for the first time on a manned spacecraft, the Soyuz 1. Even with the more efficient cell created by Hoffman Electronics, for years the only viable use of solar cells remained in space flight. In 1973, solar cells were fitted on Skylab, a U.S. space station that orbited the Earth until 1979. The solar cells were so important to the operation of Skylab that the space station only lasted six years due to the cells being damaged during launch. During the 1970s, solar panels became more efficient in part due to the work of the Solar Power Corporation. By 1977, solar panels had advanced so far that President Jimmy Carter had them installed at the White House and even provided incentives for solar power. The advances of the ‘60s and ‘70s drove the price per watt of solar energy from R1300 down to around R300. This increased photovoltaic production, which hit 21.3 megawatts in 1983. The use of solar panels continues to increase. President George H.W. Bush created the National Renewable Energy Laboratory in 1991, which continued to work with solar energy. This continued interest led photovoltaic production to hit 1000 megawatts in 1999. Since that time, President Barack Obama has had more solar panels installed at the White House, increasing public knowledge of the technology. While solar panels have come a long way over nearly two centuries, the basic technology necessary is almost identical to what it was in the 1830s. With solar energy production increasing at such a large rate over this period of time, many people remain hopeful that solar power may very well help run the world one day. At Solterra Cape & West Coast we are different because we do not exist to sell product. We exist because we believe in making a significant difference. That means we believe in comprehensive client engagement in order to understand your unique solar power requirements. This enables us to offer personalised and specific recommendations and solutions. We do not compromise on quality, and will only offer the best in class product, matched with industry leading design and implementation.